Kia SP Concept will launch in India in April 2019 and will the first Kia model in India. Since it is based on the platform of Creta, here we compare Kia SP Concept Vs Hyundai Creta, to know which one will be better. Hyundai Creta rose to success since its launch and has been amongst the top-selling cars of India. With its proper modern SUV looks and top-of-the-line features, it decimates all of the rivals, which fall in its nearby price range. Kia Motors a subsidiary of Hyundai, is making its Indian debut by April 2019, with its first model as Kia SP Concept. SP Concept is based on Creta’s platform and in India, it will borrow its engine from Creta as well. The design and features, however, would be different from Creta and as per our knowledge, it will be more premium that Hyundai SUV. 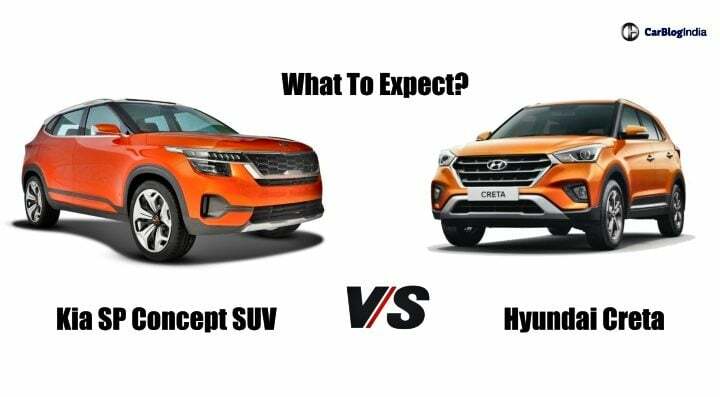 So, check out this speculative comparison of Kia SP Concept Vs Hyundai Creta. If you notice properly, Kia models are a sportier and more premium version of the Hyundai cars. Despite having the same platform and chassis, the design will be completely different. While the Creta follows Hyundai’s Fluidic design 2.0, the SP Concept would have an all-together different design pattern. We can expect sharp creases over the body with hints of sporty looks. Now, the hints of sporty looks might include a new set of alloy wheels, skid plates, chrome detailing over the front and rear portion and probably larger wheel arches. On the top, there will be roof rails and probably a dual-tone colour treatment. At the rear, it might get rear spoilers, double exhaust and large set of tail lights. The Creta follows a black-beige dual tone treatment. The SP Concept might get an all-black treatment. But as we see many of its models look sporty yet premium. So inside the cabin, SP Concept could use some chrome or false wood highlights over the AC vents, dashboard and centre console. Rest of the interior elements like seat upholstery, the instrument cluster, dashboard layout will be revised in the SP Concept. As we said, the engine specifications would be the same as it is. It is confirmed. The lower variants would use the 1.4 Litre diesel engine along with a 1.6 Litre VTVT petrol and 1.6 Litre CRDi diesel engine. The transmission duties will also be same with a 6-speed MT and 6-speed AT. The feature list would be somewhat similar. By next year, who knows what new feature might be in the fad. But, the SP Concept might also get an Electric Sunroof, Cruise Control, Rain-Sensing Wipers, Auto Headlamps and more. Different features might include LED headlamps, a revised MID and a revised instrument cluster. The safety features would include the same Hill Start Control, ESP, ABS with EBD, 6 airbags and more such features. Since it might be sportier than Creta, we can expect Traction Control feature onboard. The current Creta starts at Rs 9.50 Lakhs and goes up to Rs 13.66 Lakhs for the petrol one. The diesel one starts at Rs 9.99 Lakhs and goes up to Rs 15.10 Lakhs. Since most of the specs are similar, the prices might differ by Rs 15-20000. The SP concept would be costlier than the Creta. Most likely the prices of base variants would remain the same.